So, like the rest, Rosencrantz and Guildenstern are dead; unlike the rest, they do not die. 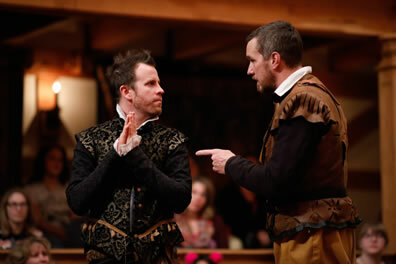 Guildenstern (John Harrell, right) makes a point that is lost on Rosencrantz (Chris Johnston) in the American Shakespeare Center's production of Tom Stoppard's Rosencrantz and Guildenstern Are Dead at the Blackfriars Playhouse. Photo by Lindsey Walters, American Shakespeare Center. In the end, there is nothing. There is our imagination and the lingering effects of a writer's imagination, but there is "no thing," as Hamlet likes to pronounce nothing when he's making a lewd pun. An ending, even one of nothing, needs a beginning—but there's nothing there, neither, except a blank slate for conception. "There is an art to the building up of suspense," says Guildenstern, the opening line of Tom Stoppard's Rosencrantz and Guildenstern Are Dead—well, actually, the opening line is Rosencrantz repeating "heads" five times as Guildenstern flips coins to him, each coin landing with its head up. No thing in no place. Stoppard doesn't give his play any setting. 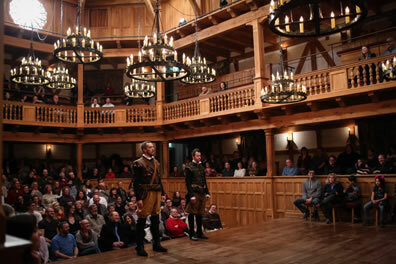 His staging instructions are “a place without any visible character.” So, the place where Rosencrantz and Guildenstern exist is the same place where we exist: In this instance, that's the Blackfriars Playhouse in Staunton, Virginia, home of the American Shakespeare Center (ASC) which is staging Stoppard's play in tandem with William Shakespeare's Hamlet. Such tandems are not unusual: This is the third time I've seen these plays paired in repertory—twice now in this theater—the same actors playing the same parts in both plays; not just Rosencrantz and Guildenstern but also Hamlet, Claudius, Gertrude, Polonius, Ophelia, Horatio, the English Ambassador, and, most importantly, The Player (so named in Stoppard's play; identified as First Player or Player King in Hamlet). Such tandem staging encourages the two plays to inform each other in presentation. Obviously, Hamlet informs Rosencrantz and Guildenstern Are Dead, but I also have seen Stoppard's play influence the playing of Shakespeare's, with Rosencrantz flipping a coin when he first arrives on stage in Hamlet, and a glint-eyed Hamlet consciously playing straight man to his two supposed childhood friends. What's unusual with this particular pairing is that it's part of the ASC's annual Actors' Renaissance Season in which the company of 12 actors stages a repertory of five plays without a director or production team and with shortened rehearsal times. In such conditions, the actors have no time for creating a conceptual layer for plays by Shakespeare and his contemporaries. Stoppard's 1967 play, however, is a conceptual layer. This Actors' Renaissance Season's Hamlet is a palpable hit, playing to capacity audiences giving it shouted ovations and leaving this awestruck reviewer strenuously resisting the temptation to call it definitive. Rosencrantz and Guildenstern Are Dead is, by similar measures, an even bigger hit, also playing to capacity crowds (standing room only on this night) and generating tremendous buzz on social media and Beverley Street (Staunton's main downtown drag). It, too, gets a roaring ovation on this night from much the same audience that attended the matinee performance of Hamlet. The generator of that love is mostly the two actors playing the title characters, longtime ASC members Chris Johnston as Rosencrantz and John Harrell as Guildenstern. ASC has a tradition of not merely casting the right actor for the right part but coupling the right actors for the right pairing (see Julius Caesar, Timon of Athens, Richard III, Pericles, She Stoops to Conquer). Harrell and Johnston as Guildenstern and Rosencrantz is the stuff of familiar comedy acts, a la Laurel and Hardy or Abbott and Costello—or, more suitably, Lemmon and Matthau, because it's not just that they are fine comedians but also strong character actors. Harrell's long-established intelligence and thespian skills imbue Guildenstern with great depth of emotion and earnest curiosity, even in his droll (or sometimes exasperated) retorts to Rosencrantz. Johnston's own acting skills continue to evolve, as he finds the absolute right groove for his Rosencrantz. Not quite as intellectual as his friend but the keener observer of the two, Johnston's Rosencrantz has a charmingly accommodating nature. As a team, the two showcase impeccable timing in their movements as well as their dialogue, both expertly managing Stoppard's incredible script of linguistic exercises and the near-constant laugh track that script and their deliveries induce from the audience. I should note that Johnston and Harrell also are known among the ASC faithful for their multidimensional musical talents, Johnston in particular serving as musical director for so many shows over the years. This is important for two reasons. One, it's a relative thing: proficient musicianship is considered a core value for ASC companies, and Johnston and Harrell, as the cream of the creamiest of corps, already have forged a sixth-sense foundation in their musical collaborations. Two, we expect them to perform a duet at some time during Rosencrantz and Guildenstern Are Dead, and it comes during the first intermission when Harrell on guitar and Johnston on stand-up bass perform Bill Withers' "Just the Two of Us" (Chris singing the falsetto segments). Notably, the two do not perform—musically, anyway—in the preshow. They do stroll onto the stage in their Elizabethan costumes while the typical Blackfriars preshow concert is going on, but they are in character as Rosencrantz and Guildenstern. Harrell's Guildenstern looks around the environs with a vaguely quizzical expression—not bothered, just curious—as Johnston's Rosencrantz sits on the stage and begins inspecting his coins. Both are oblivious to Jessika Williams (Hamlet's Gertrude) leading the rest of the cast, all dressed in black shirts, black pants, and black high-top sneakers, rocking out on Alice Merton's "No Roots." Preshow and intermission song choices always are thematically apt at ASC productions, but in this case, so are the clothes: longtime fans of the company will know the black outfits with high-top sneakers was the mode of clothing for the Shenandoah Shakespeare Express, the touring forerunner of ASC, of which Harrell was a member. In the tradition of Actors' Renaissance Seasons, each play's lead and script-editor (Harrell for this play) takes charge of that play's thematic navigation. Even in the preshow, Harrell and Johnston have not only embraced the true essence of their characters but this play's thematic essence, too. Twitter praise from someone in the audience of this particular performance sums up the talents of Johnston and Harrell as Rosencrantz and Guildenstern: "Utterly hilarious and so heartbreakingly tragic." I agree with the observation, but I have to chuckle at the sentiment: What, really, is the tragedy? If you've not seen this play, you might want to read the rest of this review after seeing it. It's not merely a case of spoiler alert (Rosencrantz and Guildenstern end up dead; yes, really! ); rather, discussing the above-mentioned "thematic essence," the transcendental enigma of this play, is similar to discussing the role of scene editing in the movie The Sixth Sense or flashback protocols in The Usual Suspects. Doing so reveals the riddles of their plots even if I don't say exactly who is dead in the former and who is Keyser Söze in the latter; and, here, how Rosencrantz and Guildenstern come to be and not to be. By the end, these two innocents (though not considered so by Hamlet) have, indeed, sailed to their reported deaths in England. They don't understand any of it—where they are, what's been going on around them, why they ended up victims when "We've done nothing wrong. We didn't harm anyone." Rosencrantz says this before coming to his conclusion (literally): "I don't care. I've had enough. To tell you the truth, I'm relieved," and he leaves the stage. Guildenstern is still trying to puzzle it all out and theorizes they must have missed an important clue. "Well, we'll know better next time. Now you see me, now you—" and he leaves the stage. These are their first exits in the entire play, and they come at the end of the play; except for intermissions, something always keeps them from leaving the stage when they try to. So, when they do finally leave, they end up dying, right? Reportedly, yes. Stoppard's play ends with the end of Shakespeare's Hamlet, the English ambassador announcing that Rosencrantz and Guildenstern are dead and Horatio's response amid the carnage, the bodies of Hamlet, Claudius, Gertrude, and Laertes littering the stage. So, like the rest, Rosencrantz and Guildenstern are dead; unlike the rest, they do not die. This is a distinction Guildenstern keeps pressing with The Player (David Anthony Lewis, who's all-knowing energy creates a perfect comic trio with Johnston and Harrell). Dying, The Player says, is what his actors do best. "They can die heroically, comically, ironically, slowly, disgustingly, charmingly, or from a great height." The other things actors do well: kill. "In fact some of them kill even better than they die. The rest die better than they kill. They're a team." Guildenstern argues that the players don't really die so they can't know death and thus, "you can't act death. The fact of it is nothing to do with seeing it happen—it's not gasps and blood and falling about—that isn't what makes it death. It's just a man failing to reappear, that's all. Now you see him, now you don't, that's the only thing that's real … an exit, unobtrusive and unannounced." Though Guildenstern ends up experiencing such a death, The Player has it right. Maybe Hamlet et al. are just as dead as Rosencrantz and Guildenstern (and Ophelia and Polonius, too), but Hamlet et al. still exist—their characters are still on stage—at the moment we hear that Rosencrantz and Guildenstern are dead. As he does in The Real Inspector Hound, Stoppard blows up the conceptual reality of theater art with Rosencrantz and Guildenstern Are Dead. Shakespeare seems to have gone to great lengths to create two keenly drawn characters for Hamlet who are, nonetheless, totally superfluous to Hamlet's plot or even its themes. They are "childhood friends" of Hamlet's and apparently fellow students, but they have no interaction with Hamlet's other good friend and fellow student, Horatio, even when they are on stage together. Their interview scenes with Hamlet are riddling interchanges. The Players don't need Rosencrantz and Guildenstern in order to arrive at the court of their own accord; the guards, Francisco, Bernardo, and Marcellus, could serve the purposes of fetching and accompanying Hamlet after he kills Polonius; and the pirate attack and Hamlet's return to Elsinore, both happening off-stage in Hamlet, are feasible developments in their own rights without companions sailing along to their deaths in England. In later plays, Shakespeare would identify such characters as First Lord and Second Lord, even when their names show up in dialogue. Here, they are Rosencrantz and Guildenstern. Think Toy Story in which the toys live beyond humans' personal, imagination-charged interactions with them; Stoppard similarly takes these oddly pertinent irrelevant characters in Hamlet and envisions them as characters in search of a play—the very play they are in. "What's the first thing you remember?" Guildenstern often asks Rosencrantz. "A summons," is the only thing the two can come up with. They don't even know their own backstory. Their only history is that they are reportedly Hamlet's longtime friends. They suddenly show up in Elsinore and find themselves in the action of Hamlet, baffled by what it all means. "For God's sake, what are we supposed to do?" Guildenstern cries to The Player. "We don't know what's going on, or what to do with ourselves. We don't know how to act." Based on the number of Hamlets I've seen, I have a feeling a lot of actors cast as Rosencrantz and Guildenstern make that very same complaint—except the actors who get to play Stoppard's version of the characters, too, because they at least have another source to form their characters for Hamlet. 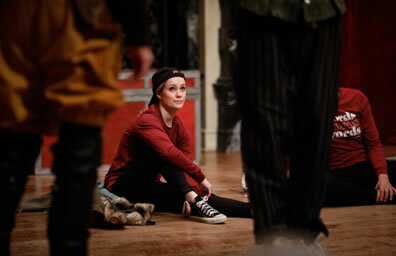 Top, A Tragedian (Lauren Ballard) in Tom Stoppard's Rosencrantz and Guildenstern Are Dead at the American Shakespeare Center's Blackfriars Playhouse. Above, Guildenstern (John Harrell, left) and Rosencrantz (Chris Johnston) and the audience share their existences. Photos by Lindsay Walters, American Shakespeare Center. Of course, the only character who really has a grasp of what's going on is The Player, an actor. He and his troupe handle the jumps from scene to scene and setting to setting without consternation. What they can't handle is not having an audience: "the single assumption which makes our existence viable, that somebody is watching," The Player says. "We're actors—we're the opposite of people." That line scores a big laugh from the theater crowd, but the ultimate joke is actually on that theater crowd. We see these characters as people; in fact, they are not people, they are figments of imaginations, the writer's, the actor's, and ours. You want existentialism? Consider that these players are dressed in the foundational outfits of the Shenandoah Shakespeare Express: Lewis puts a Renaissance tunic over his black outfit, the others don modern t-shirts available out in the lobby gift shop bearing Hamlet's line, "Words, words, words." That reflects the MO of the Express, traveling from town to town, creating stages out of whatever environment was available to them, and putting on Shakespeare plays for audiences who would come out to see them, and that same MO is used by the players in Shakespeare's and Stoppard's plays. Those early Express audiences maintained the company's existence, leading to Staunton building the Blackfriars Playhouse as a permanent home for the company, which changed its name to the American Shakespeare Center and expanded its education and theater operations, earning a reputation of international renown. And here we are in this playhouse, owing our own existence here to those early audiences, the characters existing only because we are here: Rosencrantz and Guildenstern are alive, thanks to us. This thematic thruway, set forth in the preshow, continues into the curtain call. In a theater using universal lighting, there are no blackouts—though this production breaks with that tradition by attempting a total blackout in act three; given that this theater is built expressly to use Shakespeare's staging conditions even for modern plays, this company's clumsy attempt at a technical blackout as opposed to an allegorical one is the production's only misstep. When a play ends here, without a blackout, audiences know it's time to clap when the actors obviously drop their characters from their aspects, the dead bodies get up, and all prepare to take a bow. On this night, however, as soon as Horatio (Allie Babich) delivers the play's closing line, Lewis, standing to the side as The Player watching his troupe perform Hamlet's last scene, starts clapping. We follow.